Coverage: Live commentary on BBC Radio 5 live, BBC Sport website and BBC Sport app, plus live text commentary online. 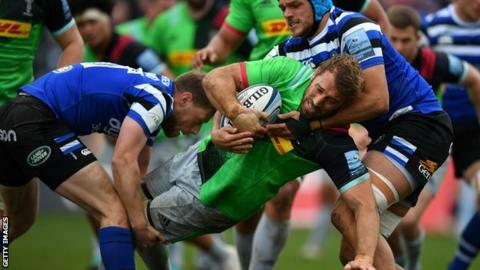 Former captain Chris Robshaw is in "as good a shape as we've seen him" after being added to England's training squad, says scrum coach Neal Hatley. The flanker, 32, has been included in England's 31-man squad to face Italy in the Six Nations on Saturday, while Maro Itoje also returns from a knee injury. Robshaw's last England cap came against South Africa in June, while he sat out the autumn series with a knee injury. "He's in really good condition," said Hatley. England head coach Eddie Jones and forwards coach Steve Borthwick joined Hatley as they watched Robshaw play for Harlequins during a 31-29 victory at Bath on Saturday. "Chris looked good. He's come back in good shape and his big challenge now is to add value," he added. "Last weekend he made 28/30 tackles and got two turnovers. He's come back in good shape and his big challenge now is to add value. "He's combative and very dependable. He's got an excellent work-rate and he doesn't make many mistakes. That's quite a good commodity." Robshaw will face competition at blindside flanker from Mark Wilson, with Jones also favouring Brad Shields in the position. "Everyone has a chance to play. It depends on how he goes over the next two days of training," said Hatley. "We've talked continuously about developing strength in depth and we see Chris as an important part of that." Also named in the squad is Bath centre Jonathan Joseph, who has not featured for England since last year's Six Nations because of ankle surgery. Forwards: Dan Cole (Leicester Tigers), Luke Cowan-Dickie (Exeter Chiefs), Tom Curry (Sale Sharks), Ben Earl (Saracens), Ellis Genge (Leicester Tigers), Jamie George (Saracens), Alec Hepburn (Exeter Chiefs), Nathan Hughes (Wasps), Maro Itoje (Saracens), George Kruis (Saracens), Joe Launchbury (Wasps), Ben Moon (Exeter Chiefs), Chris Robshaw (Harlequins), Brad Shields (Wasps), Kyle Sinckler (Harlequins), Billy Vunipola (Saracens), Harry Williams (Exeter Chiefs), Mark Wilson (Newcastle Falcons). Backs: Joe Cokanasiga (Bath Rugby), Elliot Daly (Wasps), Owen Farrell (Saracens) captain, George Ford (Leicester Tigers), Jonathan Joseph (Bath Rugby), Jonny May (Leicester Tigers), Jack Nowell (Exeter Chiefs), Dan Robson (Wasps), Henry Slade (Exeter Chiefs), Ollie Thorley (Gloucester Rugby), Ben Te'o (Worcester Warriors), Manu Tuilagi (Leicester Tigers), Ben Youngs (Leicester Tigers).